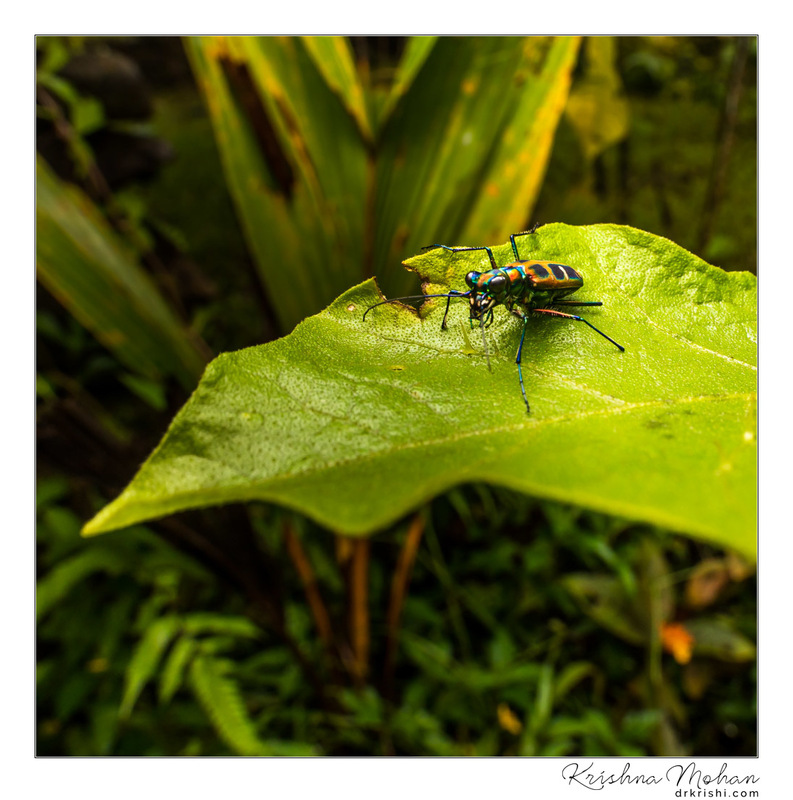 I took this capture of the Tiger beetle at Mannapapu mane at Mala Village during 2017 Macro & Waterfall Workshop. There really is no other lens quite like the Laowa 15mm f/4 Wide Angle Macro lens. It is unusual for a lens this wide to be officially labelled a macro lens. Yes, this is the world’s widest macro lens, with 12cm minimum focusing distance and a 1:1 (life-size) reproduction scale. In order to obtain sharp focus for 1:1 magnification, the lens will practically need to be touching the subject in question, such is the close distances at play here. The reality then is there are many hindrances to overcome for macro work, not least of which is lighting the subject properly. In most circumstances, the lens itself will be blocking out the light from your subject. 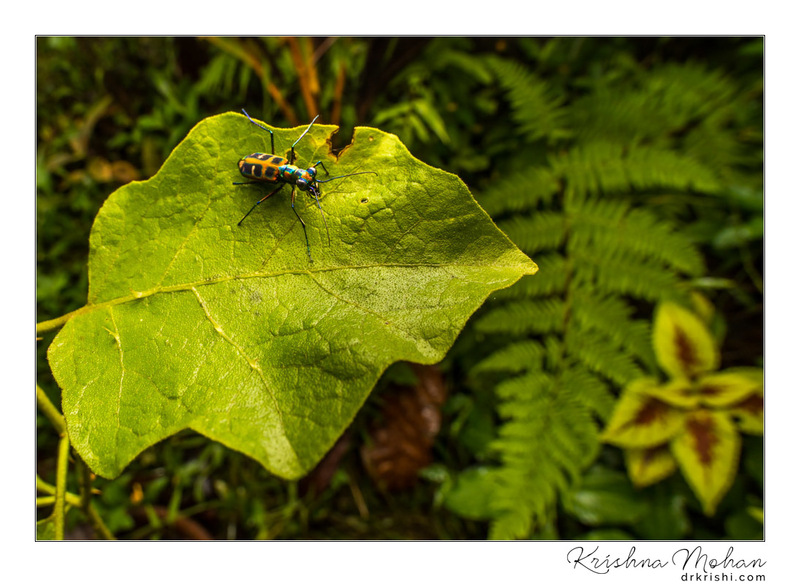 With a bit of practice and a lot of fiddling, I opted for a less than 1:1 image of this beetle. I was using Canon EOS 5D Mark IV with DIY reflector fitted to Godox Ving V860C II E-TTL Li-ion Camera Flash. 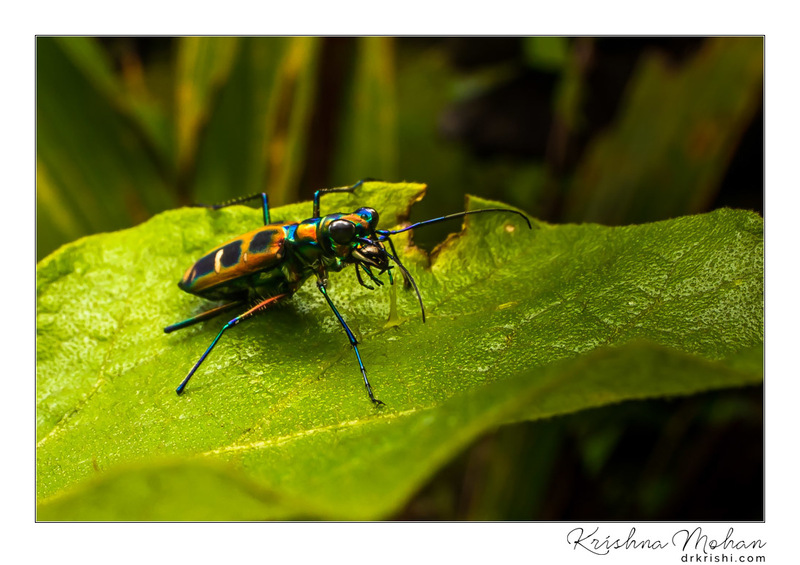 Tiger beetles are a large group of beetles, from the Cicindelinae subfamily, known for their aggressive predatory habits and running speed. 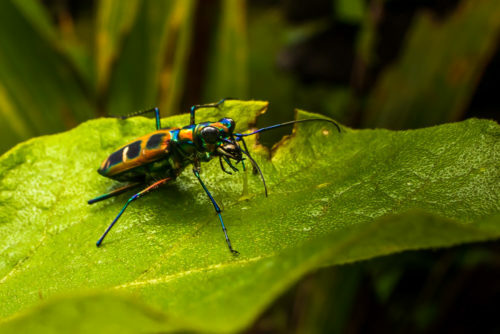 The fastest species of tiger beetle, Cicindela hudsoni, can run at a speed of 9 km/hour or about 125 body lengths per second. 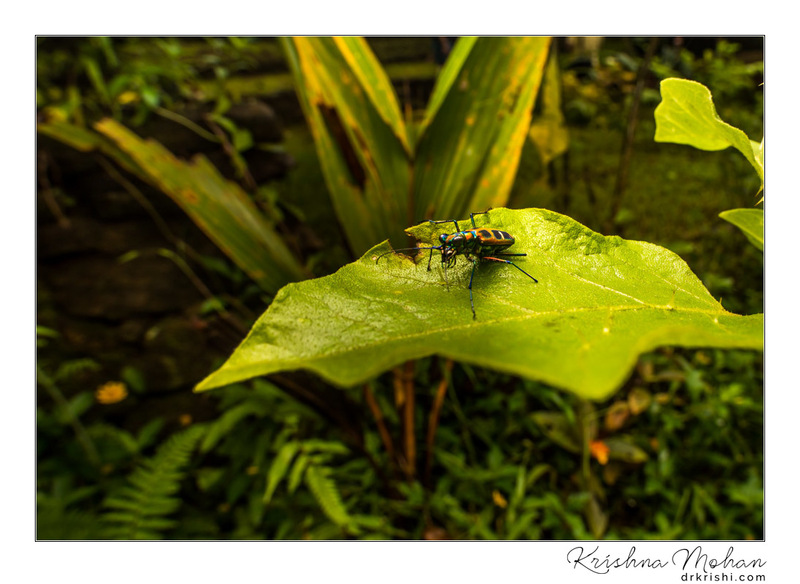 Tiger beetles often have large bulging eyes, long, slender legs and large curved mandibles. All are predatory, both as adults and as larvae. The genus Cicindela has a cosmopolitan distribution. Other well-known genera include Tetracha, Omus, Amblycheila and Manticora. 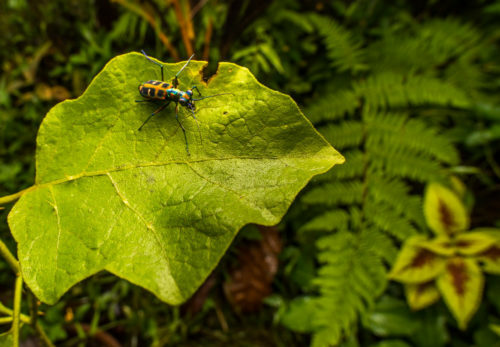 While members of the genus Cicindela are usually diurnal and may be out on the hottest days, Tetracha, Omus, Amblycheila and Manticora are all nocturnal. 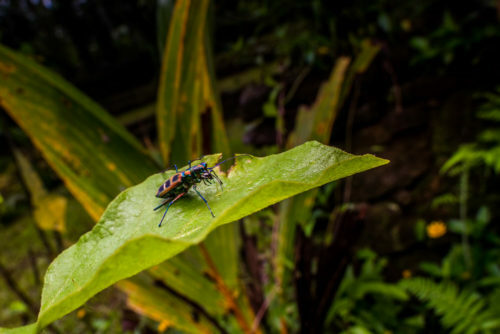 Both Cicindela and Tetracha are often brightly coloured, while the other genera mentioned are usually uniform black in colour. 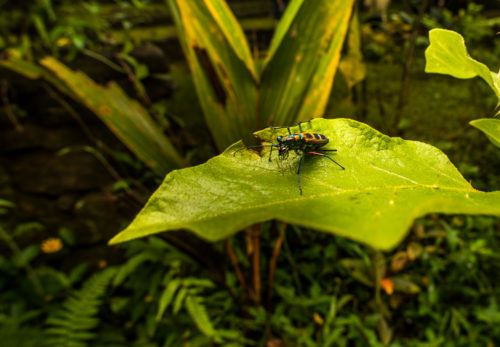 Tiger beetles in the genus Manticora are the largest in size of the subfamily. The larvae of tiger beetles live in cylindrical burrows as much as a meter deep. They are large-headed, hump-backed grubs and use their humpbacks to flip backwards, for the purpose of capturing prey insects that wander over the ground. The fast-moving adults run down their prey and are extremely fast on the wing, their reaction times being of the same order as that of common houseflies. 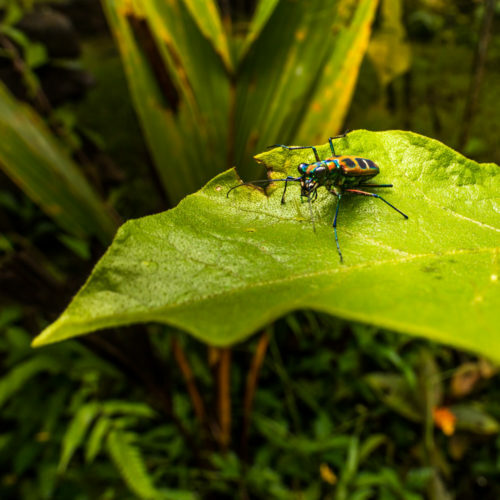 Some tiger beetles in the tropics are arboreal, but most run on the surface of the ground. EXIF info - Camera : Canon EOS 5D Mark IV | Taken : 10 September, 2017 | Flash fired : yes | ISO : 400 | Location : 13° 13.6017′ 0″ N 75° 8.2222′ 0″ E | Shutter speed : 1/50s | Images and content Copyright © Krishna Mohan. Please contact me to purchase prints or for image publication license. 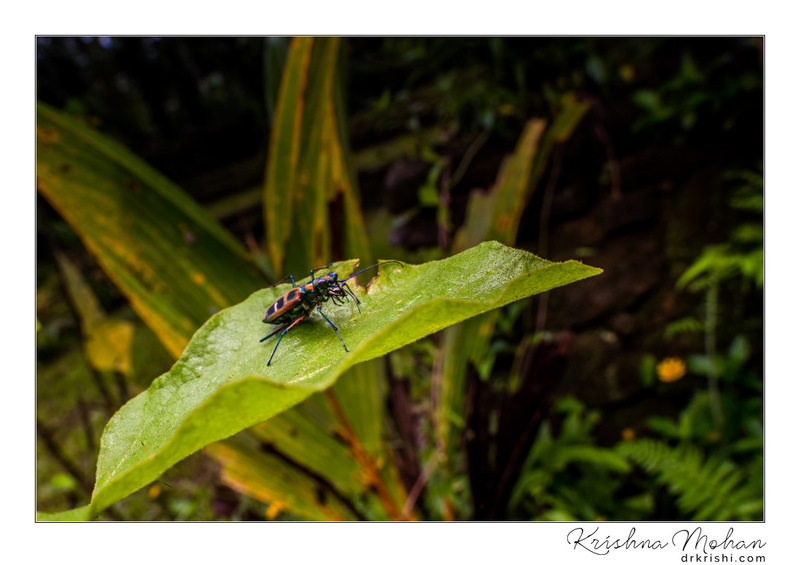 EXIF info - Camera : Canon EOS 5D Mark IV | Taken : 10 September, 2017 | Flash fired : yes | ISO : 100 | Location : 13° 13.6017′ 0″ N 75° 8.2222′ 0″ E | Shutter speed : 1/50s | Images and content Copyright © Krishna Mohan. Please contact me to purchase prints or for image publication license.